Place the cumin, paprika, coriander, black cardamom, ginger, cinnamon and mustard in a small pan, and heat over medium heat until the first tiny wisp of smoke appears. Allow to cool, then grind in a grinder. Peel the cucumbers, cut them in half lengthwise and cut the halves into half-inch slices. Peel and pit the mangoes and cut the flesh into bite-sized chunks. Cut the red and green bell peppers into thin strips. 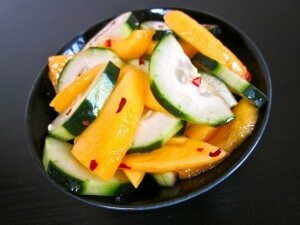 In a large bowl, combine the potatoes, cucumbers, mangoes and bell pepper. Add the orange juice, ginger, lemon juice, mint and 1 tablespoon of the spice mixture. Toss well, season to taste with salt and pepper, toss again, and serve.